Insulin Spike Makes You Fat – Stressed Out? Attention everyone this statement does not apply to Bodybuilders or Athletes. Insulin spike is an important process of muscle growth and does have its advantages for people who are looking to increase strength and speed. However if you are an average people who is looking to lose weight or control your diabetes than insulin spike can be a problem. If you are the type of person that grabs a bagel with cream cheese in the morning and sits in front of a computer all day. Regardless if that bagel is whole wheat or multigrain, etc the insulin spike will unfortunately turns into fat. Carbohydrates are designed to store energy into muscle and fat cells. If too much accumulated stored energy is not being used, it will turn into glucose and store itself into body fat. If you are conscious of the intake of Carbohydrates you eat. You can regulate your insulin throughout the day and have plenty of energy and still burn fat without having to run a marathon or attend boot camps everyday. 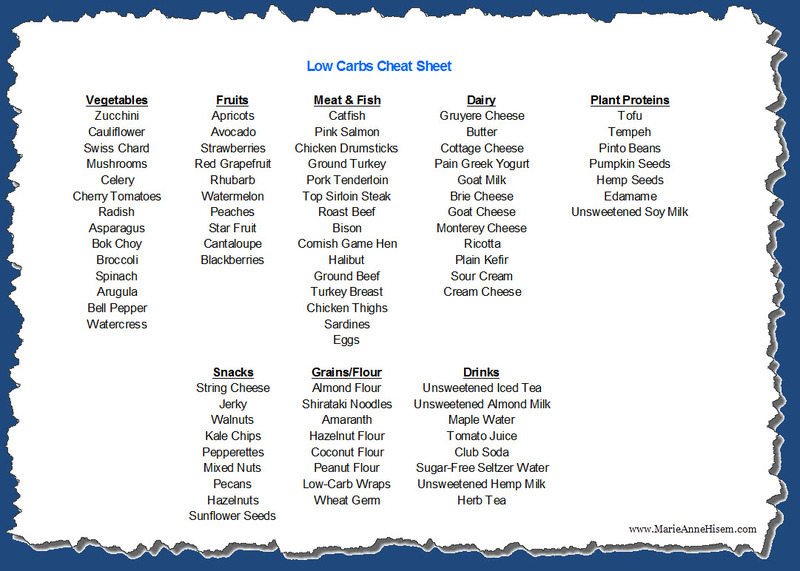 Below I have created a Low Carbohydrate Cheat Sheet that doesn’t spike your insulin. Enjoy!